Lithograph of the Wisconsin State Capitol, surrounded by portraits of Wisconsin Statesmen. 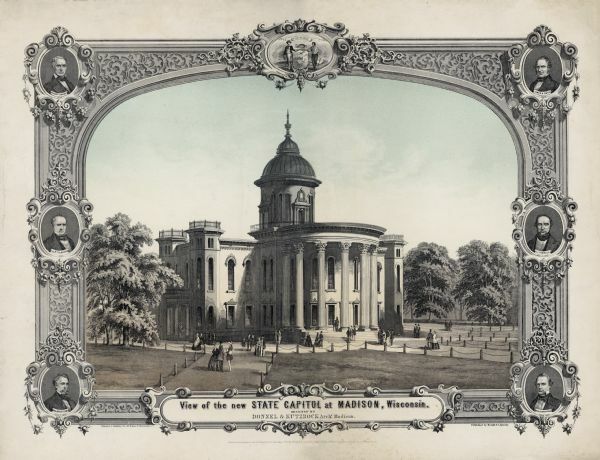 Governor Bashford hired the Madison architectural firm Kutzbock and Donnel to design an addition to the capitol, which would be the first phase of the construction of an entirely new building. Kutzbock and Donnel's proposed a modest structure with two large porticoed wings to house legislative chambers, octagonal towers at the corners, and a small, cupola-like dome. See Image ID: 38567 for close-up of inset of Coles Bashford, and Image ID: 38566 for close-up of inset of Governor Barstow.